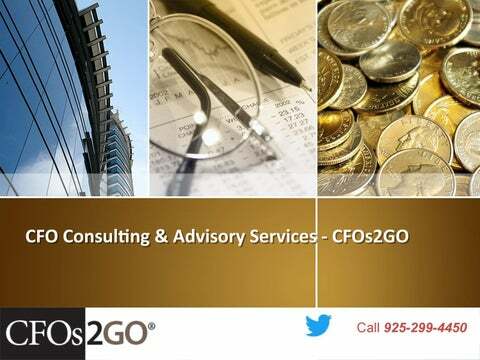 About CFOs2GO CFOs2GO provides CFO advisory services in finance and accounting on an interim and consulting basis as well as direct hire recruitment. We are structured to produce better value to our clients by providing both CFO consulting services and recruiting capabilities, each supporting and enhancing the other. CFO Consulting Services Our consulting CFOs work on short-term projects, fill gaps in staffing, provide domain expertise when needed and take on long-term CFO responsibilities, as required. Projects-Based Consulting When you have a defined need and specific objective that must be met, a project-based engagement can execute within a prescribed time frame and budget. Our Consulting CFOs can parachute in, get up to speed quickly and immediately add value, and deliver results in a timely and cost-effective manner. Board Advisory Services Our board advisory services and functional committee assignments are available to private, public and non-profit boards. We assess overall board-level and managerial-level corporate governance, address organization structural and control deficiencies, and otherwise direct the companyâ&#x20AC;&#x2122;s compliance with the provisions of Sarbanes-Oxley. Hiring Advisory Services We provide CFO advisory services: from helping you define clearer job descriptions to organizational planning and growth projections.